Dinner in Tric Trak opposite the Duomo. Tartufo night. We shared the house starter of bruschette al tartufo and tiny parcel of white onion. I then had Taglionlini al Tartufo and Lesley had Strongozzi with a slightly spice sauce. Outstanding food. 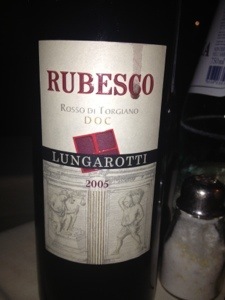 I fancied a Sagrantino to end out visit to Spoletto but the rather pricey Umbrian section of the wine list precluded that so at €15 this Lungarotti stood out as potential value for money. Which it was – a slightly dull ruby colour, perhaps because it is unfiltered. Faint whiff of herbs. Thin body, fruity finish, slightly musty. Ready to go now. Went well with the pasta. 70% Sangiovese and 30% Canaiolo. The book says any wine by Lungarotti in Umbria is good and the Torgiano vineyard was recently used as a stop-over for the launch of the new Jaguar F-TYPE. 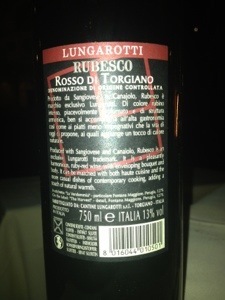 Apparently, Rubesco Rosso di Torgiano is one of Italy’s first DOC wines, dating back to 1968 and “Rubesco” is a Lungarotti trademark deriving from the Latin verb “rubescere”, to blush!